In a previous video I discussed what an academic integrity or honor code hearing is. In this video I am going to discuss the importance of bringing an adviser to the hearing. What is an adviser for academic integrity and honor code hearings? An adviser sits in with the student during the hearing and assists them in presenting their defense. Can I bring an adviser to my university honor code hearing? Maybe. That depends on your university. Check your student handbook for the rules regarding advisers. Most public schools allow advisers but private schools can restrict the attendance of an adviser. 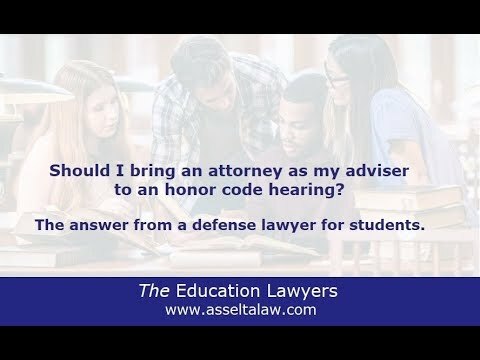 How can an honor code hearing adviser help me? I see several benefits to the participation of an adviser in an academic integrity hearing. I help students prepare for the hearing, present their case, and support them during the hearing.